While Seward is surrounded by Kenai Fjords National Park it's most famous for the areas only accessible by boarding on of the small and medium sized day tour boats sailing daily out of the small boat harbor adjacent to the cruise ship dock and terminal in Seward. Rated as the top attraction in Seward, Kenai Fjords National Park is one of the best cruise tours you will surely never forget. Book your tour on the ship or over the internet before you arrive as these tours are often book up days in advance. There are some 40 glaciers that flow down from the Harding Icefield and into Kenai Fjords National Park. You have the option for full and partial day cruises as well as a the popular dinner cruises sailing daily out of the small boat harbor adjacent to the cruise terminal in Seward. Kenai Fjords Tours out of Seward AK. National Park Rangers provide narration on many of the cruises offered by Major Marine Tours and present programs daily at the Kenai Fjords Wilderness Lodge located on Fox Island in Resurrection Bay. 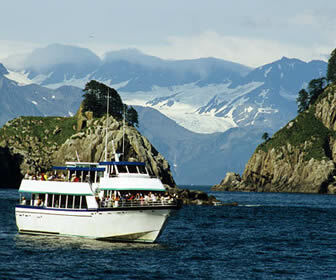 Major Marine Tours offers an extremely large selection of day cruises out of Seward spanning from 3 to 9 hours in length. Additionally Major Marine offers packages for day cruises combined with kayaking tours in Resurrection Bay and loads of whale watching tours too. Book a pre or post cruise excursion package with Major Marine and let their experience make all of the connections for you. These no hassle options are customized to take advantage of every minute that you are in port and get you to your ship in time for hassle free boarding. The 7½ Hour Kenai Fjords National Park Cruise plus your Alaska Railroad or Motorcoach Transportation from Seward to Anchorage is ideal for cruise ship passengers who are disembarking in Seward. The price for cruise passengers is outstanding too but must be booked by calling Major Marine Tours in advance. We have included their contact information below.